Sausage salad - Bavarian, Swiss or Austrian? But when the sunshine broke through around lunch time, just in time to inspire my thought process around various lunch options, I decided for another beergarden staple: Sausage salad (Wurstsalat). A dish that took me more than 25 years to finally try and more than 30 to fall in love with – despite the fact that I was born right into a family of sausage salad lovers. Will you be easier to convince? Let’s see: It’s a perfectly hearty snack, easy to make ahead for a picnic or beergarden visit and it keeps well in the fridge. You do have craftspeople in your house? This is the perfect snack for them, year-round. You want to give it a little extra something? I give you three words: pumpkin-seed oil. Dress this salad with pumpkin-seed oil instead of regular vegetable oil and while this doesn’t necessarily add to the salad’s visual appeal (imagine dark greenish-brown cheese stripes…), the nutty taste makes up for it many, many times. Prepare the ingredients: Peel and slice the sausage into either fine slices or stripes, the cheese into fine stripes. 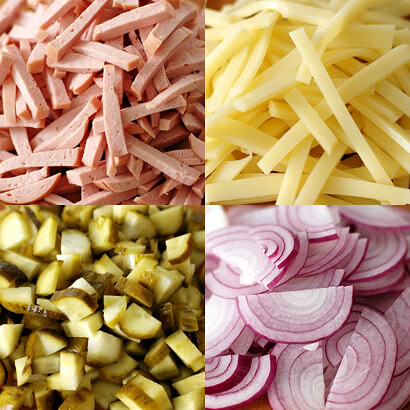 Cut the gherkins into little cubes and half the onions before you cut them into thin slices. Add the ingredients to a large bowl. Dress the salad with water from the gherkins preserve, vinegar and vegetable oil, then season to taste with sea salt and black pepper and toss gently. Chill for at least half an hour – re-season if necessary – and serve with slices of fresh bread. Here in Alsace (NE France) a similar salad of sausage, cheese and dressing is available in lots of restaurants as 'Alsatian salad. When you say gherkins, do you mean sweet gherkins, or cornichons? AUSTRIAN! (i think). the swiss version has tons of mayo in it, at least that's where the difference lies for me! perfect picnic food! Never knew you could make a salad containing sausages! Thanks for sharing, I have to bookmark this . As far as I know, Wurstsalat with cheese is the swiss version - at least in local bavarian and franconian restaurants. Maybe the Swiss tell otherwise. The bavarian is more puristic using only onions, sausages and pickled gherkins. Using flavorful pumpkin seed oil is a very nice idea - I've never heard of an Austrian Wurstsalat, but with pumpkin seed oil it's definitely Styrian. I think also the vinegar needs to be addressed - it has to be a very gentle one, otherwise it dominates and destroys the whole salad. Definitely Swiss, because of the cheese! Using Gruyère instead of Emmentaler or half and half gives this recipe a nice touch - plus you might try to grate the cheese instead of cutting it into cubes, using a grater with big holes (Röstiraffel) ... Yummy! I'll prepare one over the weekend. 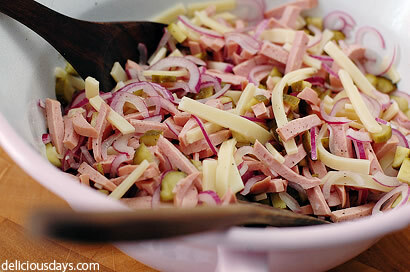 Wurstsalat is very common in Switzerland, mostly served with a mixed salad as a side dish - or even french fries. The pumpkin seed oil is really a good idea. Just one question - my mother in law always makes a close variant of this salad, but she blanches the onions for a moment before adding them to the salad, turning them a little less poignant... I always thought it a good idea, but admittedly never had one with raw onions. Would you think raw is better, with more bite, or is blaching a good idea? Dear Reuben, I've read about blanching the onions, but never had the chance to deliberately try these in a salad. I'm pretty sure, if you choose the milder red onions and cut them really thin, the raw onions won't bother you at all, but you save both, time and some bite ;) Let me know, if you like it with raw red onions! My family loves this salad with appenzeller cheese andthinly sliced red bell pepper. Together with crispy bread and boiled eggs they say "yum"! The sausage salad made in Switzerland calls for mayonnaise (not lots, just a tablespoon) and mustard in the dressing. The sausage and cheese are cut into slices, which imho makes a big difference to the taste. The term "Swiss sausage salad" is used in Southern Germany to describe sausage salad with cheese. Oh, ich liebe den Schweizer Wurstsalat, also den mit Käse. Habe ich auch schon selbst gemacht, war aber nicht 100% zufrieden mit den Ergebnis - also danke fürs Rezept. I loved this as a child (still do) and used to consume very unhealthy amounts of this for breakfast! Funny, I never thought of making it at home. 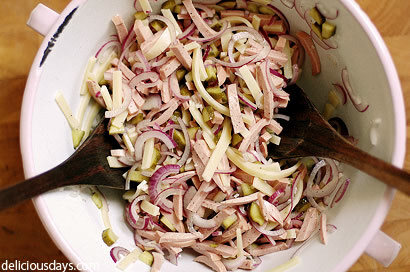 My guest family introduced me to Wurschtsalat and I immediately loved it. Their recipe doesn't use cheese, but radishes, and it was very good! Oooooh, I love how pretty and dressed up this salad looks. I've never made anything like it, yet it feels so familiar - like a pasta salad tossed with salamis. I'm a vegetarian right now, but I'm feeling a little cheat coming on for the hubby's sake - as he'd adore this with a nice pint. Thanks again for this awesome salad! After our (me and Paolo) bike holiday along the Romantische Strasse, I've had the difficult task to replicate the Wurstsalate. Oooh this basically looks like the best salad ever!! Amazing! Surprisingly this is so easy to prepare and perfect indeed for beer gathering. If you want to order Swiss Sausage Salad in a restaurant in Badem-Würtemberg you can either have the version with cheese (Swiss) or without (probably German?) But, @Johanna, living in Switzerland for 38 years now, I've never ever had any kind of Sausage Salad that contained mayonnaise, here it's traditionally made with a vinegar and oil sause. I remember this one from visits to my Frankonian granny, only without the cheese, but all the other of your ingredients - well she probably never knew pumpkin seed oil in her days. In Frankonia, this is called Stadtwurst mit Musik (sausage with music). I am Swiss and we make it with a sausage called Cervelas. It's making me hungry! No chance of getting any as I no longer live in the homeland. I tried your recipe. Perfect ! I use it as the main theme of a dinner at home during a raining day in Rome. I did wurstsalat with purè made of potatoes and celery and then red turnip. Thanks for the recipe - I'm going to make it for a fall barbecue (maybe our last!) here in Massachusetts. About the onions - if you want them milder, you can also slice, then salt generously, and leave overnight in the fridge. Rinse well before tossing with the other ingredients. The flavours reminded me my stay in Münch many years ago. In two words: Easy and delicious. Thank you for sharing your good recipes and photos. To my opinion only german chefs call a wurstsalat with cheese „swiss wurstsalat”. Because switzerland is the first country they are thinking of when it comes to cheese. I wouldn’t call it austrian because of the oil - the classic „saure Wurst” has normally no oil in it, and to me there is enough fat in the sausage, so I prefer the austrian version (but with poppyseed oil, maybe…) But if the sausage is no good, it won’t help. I am sure, Nicky has always great sausages in the fridge. The real Inventors of the basic Wurstsalat (without Cheese) are missing! Who invented it? Of course the Swabian People! I made this in large quantities while working for a small western German hotel chain in the early 90s...but hadn't thought to make it since! Thanks for the reminder of a recipe that my husband will adore. I have eaten a Swiss Sausage Salad when i was in Austria (Schuttdorf, near Zell am See), loved it and I've been searching for the recipe ever since. This recipe seems to be it and I will definately make it sometime soon, provided I will find the required sausages in Romania. Will keep you posted and thank you very much for the recipe! That looks fantastic. I've never had it with cheese before. My Dad is Austrian, and the version he likes my (not Austrian) mother to make is just white onions and sausage sliced in thin rounds with a simple vinaigrette as the dressing. At my parent's house (near Heidelberg, Baden-Württemberg), it was usually paired with a serving of Bratkartoffeln (fried potatoes). My mother also adds sliced tomatoes (the lil' cocktail ones work best) to the base salad to take some of the heft out – yum! 1) Try to find German pickles in your grocery store's international isle (Kühne, Hengstenberg & Gundelsheimer seem to be easiest to find here in the Southeastern US), they taste entirely different from the "standard" 'Murrican pickle you may be used to. 2) Finding good "Wurst" (German Bologna) can be a bit of a challenge here, but do try to ask your butcher to slice it a bit more thickly than usual. That way your Wurstsalat will a) look nicer, and b) the Wurst will retain more of its flavor. Here in Basel, it is normally served with a few leaves of greens (and an occasional sliced radish) with a choice of French or Italian dressing. Maybe the French dressing is mistaken as mayo? There's also a version with French Fries but without the cheese called (naturally) Wurstsalat mit Pommes-frites. My favourite!